I almost forgot to show you the cord. Here it is. One tube needed to be replaced. 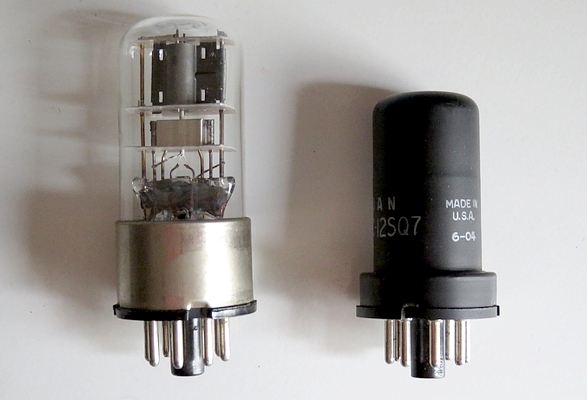 On the left is the 12SQ7 glass vacuum tube that was replaced with the metal tube on the right. 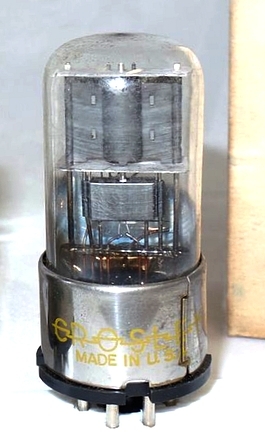 The 12SQ7 is three tubes in one, sort of an early integrated circuit. It contains a triode and two diodes, and is used to detect the radio signal, is the first stage of audio amplification, and performs the Automatic Volume Control function. 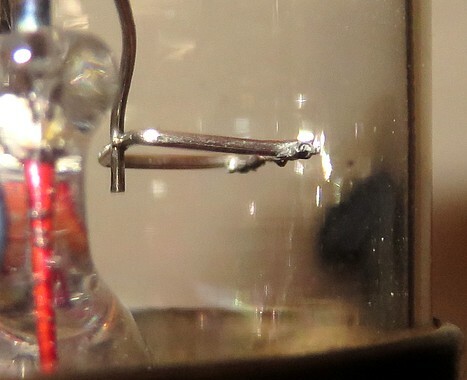 Forthwith and henceforth, we shall call the glass 12SQ7 the "Mystery Tube." It's a mystery who made it. 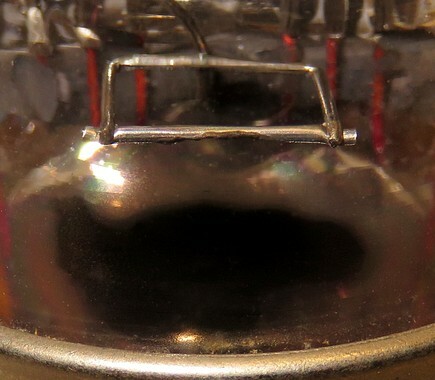 There are no markings on the Mystery Tube, other than the designation "12SQ7" in a circle on the top, and a dull spot on the base that looks like a paper label or piece of tape was once there. Someone in the past probably cleaned it with a wet rag and wiped the ink off the base. Let's do an Internet search of tube sellers, and look for a glass 12SQ7 in a silver metal base with "12SQ7" in a circle on top. Here's a good candidate! Must be a HYTRON. Nope. 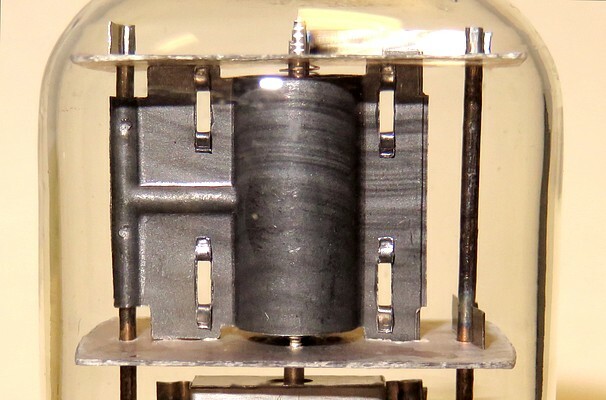 Take a close look at the tube elements. The Hytrons only have a half plate. Other tubes have a full plate. The "Mystery Tube" on the right has 3/4 of a plate. Whoever manufactured this tube chose to crimp the plates together and then snip them so it wasn't necessary to slide the unit down both supports. 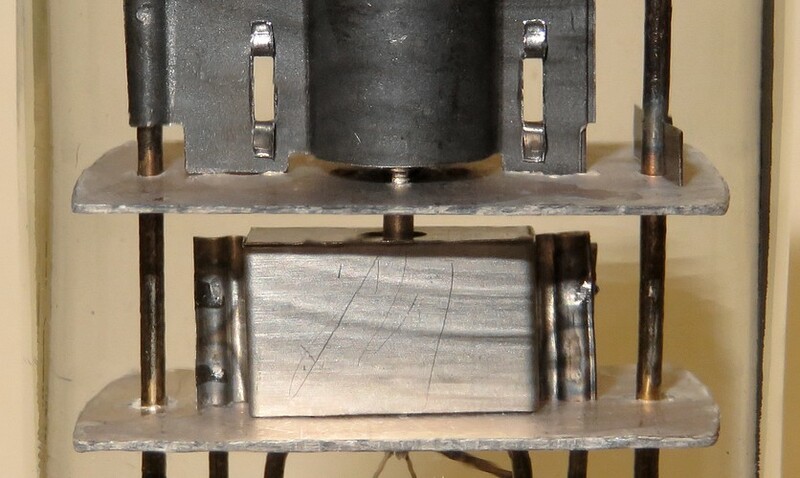 Instead, it is held in position on the right by tabs going through the mica, and the right-hand support is the electrical connection to the grid. The assembly of the various elements appears to have been done by hand. 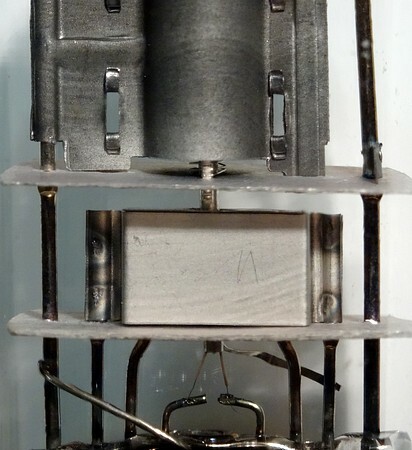 I also found Firestone, Phillips, Regency, Raytheon, Tronal and Ward Phillips 12SQ7s but they have a different internal structure, so they aren't the Mystery Tube manufacturer. I could not find a single picture of a 12SQ7 with a 3/4 size plate. This is by no means an all inclusive list, as there were once over 40 tube manufacturers in the USA. It was also an Internet search, so it only reflects what people choose to put on the Internet. An interesting observation is that when the getter in this tube was flashed, it left a very small getter spot on the glass. It must have been made with an extremely hard vacuum. 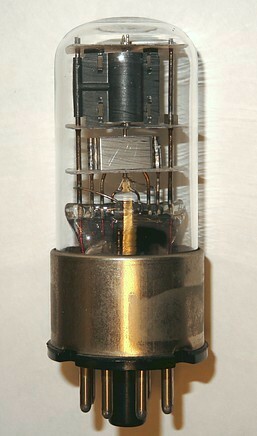 Some tubes have a "getter mirror" that covers half the tube. The construction is very crude by modern standards, but this 12SQ7 is an electronic marvel. It's the handwork of artisans in some forgotten factory, and a piece of radio history. A 12SQ7 GT owned by Dwight Hill. A perfect match to the Mystery Tube. It's a HYTRON after all! 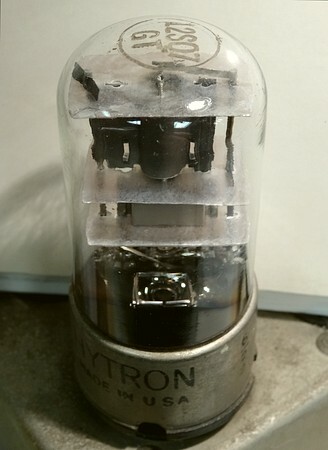 Dwight Hill of the Southeastern Antique Radio Society went through his stock of 12SQ7s and found this matching Hytron vacuum tube, solving the mystery. Thanks Dwight! The Hytron company was founded around 1921 in Salem, Massachusetts. Two brothers, Bruce and Lloyd Coffin, made tubes by hand in the basement of their home. There's no way to prove it, but they may have made these very tubes, as they are obviously hand made! The Hytron Company grew by 600% during World War II, and merged with CBS in 1951. By the time the Coffin brothers retired from active management in 1954, CBS-Hytron had five factories and employed over 6000 workers. On October 18 of that same year, the REGENCY TR-1 went on sale. It was the first commercially produced transistor radio. 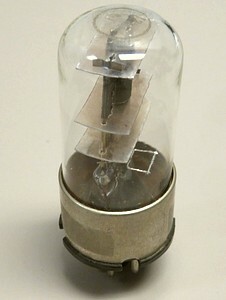 A year earlier, in 1953 Raytheon began selling the CK722 transistor to hobbyists. In 1955 Philco made the first all transistor car radio. 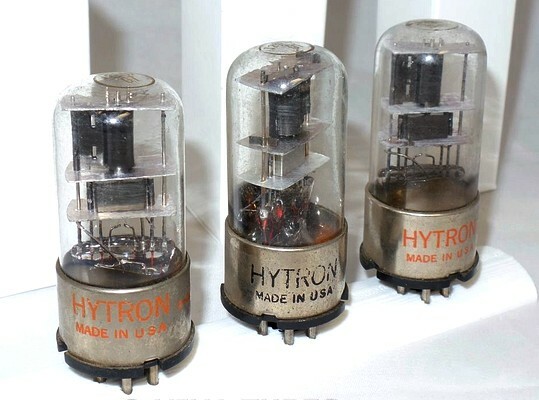 Vacuum tube radios and those five CBS-Hytron vacuum tube factories were soon to be a thing of the past. After 29 years, the Coffin brothers must have known when to call it quits. We now conclude this broadcast. Tune in any time with our non-existent app.